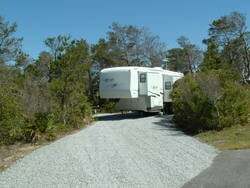 Description: Great campground right in the middle of Destin Florida, but you would never know you were in the middle of Destin. Itâ€™s very private and the sites are huge. The beach is beautiful and is located about 1/4 of a mile down a walking or bicycle riding path. I would rate this campground a 10, even without the sewage hook up. It offers water and electric at each site and a dump station on the way out. Stayed here in a 40 MH March 06, close to shopping restaurants beaches etc etc. They are always full make res at least 6 mos in advance. One of the best!!! The only drawback is you have to make your reservations 11 months ahead. If not, you will not likely get in. This is a very popular park. This park is definitely a 10 even without sewer hook-ups.